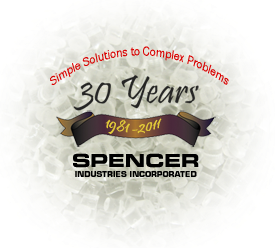 We are very excited to be celebrating 30 years of Custom Thermoforming!! Our company is a very strong locally owned and operated business. I wanted to share with you a little bit of our history, as many people do not realize how we started into the Thermoforming business. We are a very unique company nestled in a small town in Southern Indiana. We started out thermoforming plastic as Thermwood Corporation where we thermoformed wood grained plastic products for the furniture industry, hence the name "Thermwood". In 1981 Thermwood made a corporate decision to become totally automated, and they set out their dream to build CNC Routers. We then set out on our mission to provide Custom Thermofoming. We built a facility next door and purchased the Thermoforming and Sheet Extrusion assets of Thermwood. With our company headquarters being located in beautiful Spencer County, Indiana we decided to name our company "Spencer Industries Incorporated". Our company began with 58 employees in 1981. Now in 2011 we have over 200 employees in our Indiana & South Carolina facilities. We are proud to say that many of those same experienced employees are still working with us today! Over the past 30 years we have expanded our Thermoforming, and warehouse facilities many times. There were also purchases of new facilities in El Plaso, Texas and in Hampton, South Carolina. The El Paso facility is no longer open, but we do currently produce large amounts of Thermoformed plastic products in our Hampton, South Carolina facility today! Over the past 30 years we have also achieved several awards for our unique Thermoforming abilities. These abilities are continually improving as we learn new ways to improve or products and business.